Gold fell -3.39 [-0.27%] to 1229.60 on heavy volume, while silver fell -0.15 [-1.03%] to 14.42 on very heavy volume. The buck shot up +0.76%, a very strong move, which seemed to act as an overall drag on metalsprices. Part of the dollar move came following the FOMC announcement at 2:00 pm – which I completely forgot about this week! The Fed held rates steady, and their announcement was little changed from the last statement 6 weeks ago. So why would the buck spike on “no change from the Fed?” My guess: some traders had hoped that the Fed would bow to Trump's demands to cease interest rate increases, and the unchanged announcement more or less crushed those hopes. The Fed will continue rolling off its balance sheet (now at a rate of roughly $50 billion per month), and will probably raise rates another 3 more times. The prospect of higher rates makes the dollar more attractive, so money flows in, and the dollar rallies. COMEX GC open interest rose +5,983 contracts. Rate rise chances (December 2018) fell to 76%. Today's Fed announcement erased the chances of an 0.5% rate increase. Silver moved steadily lower all day long, with one particularly strong move at about 8:25 am. Unlike gold, the buyers were not nearly as enthusiastic. 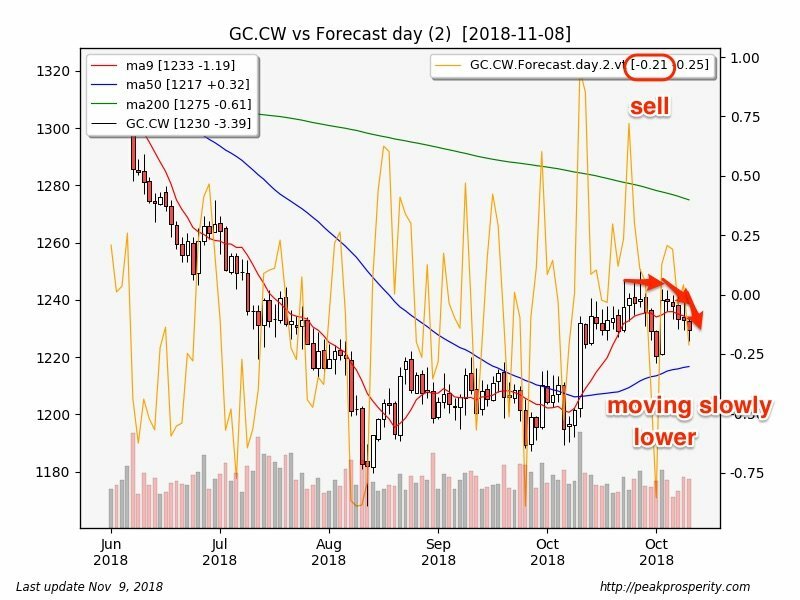 The long black candle was a bearish continuation, and forecaster dropped -0.12 to -0.10, which is a sell signal for silver. Silver ended the day below the 50 – it is moving towards the lower end of its recent trading range. 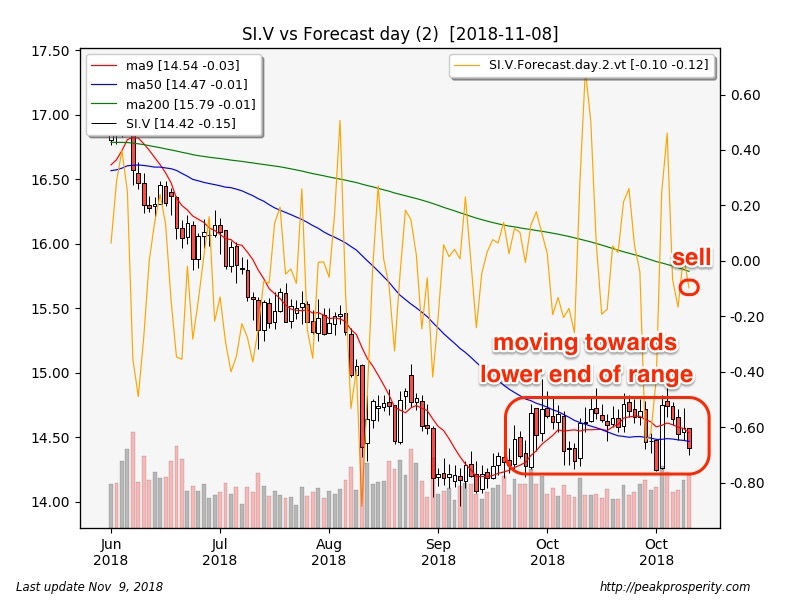 Silver is now in a downtrend in the daily and monthly timeframes. COMEX SI open interest fell -2,110 contracts. The gold/silver ratio rose +0.64 to 84.74. That's bearish, but the current level for the ratio suggests PM could be at or near a long term low. That has been true for a while now. Miners were mixed, with GDX up +0.36% on moderate volume, while GDXJ fell -0.47% on moderate volume also. 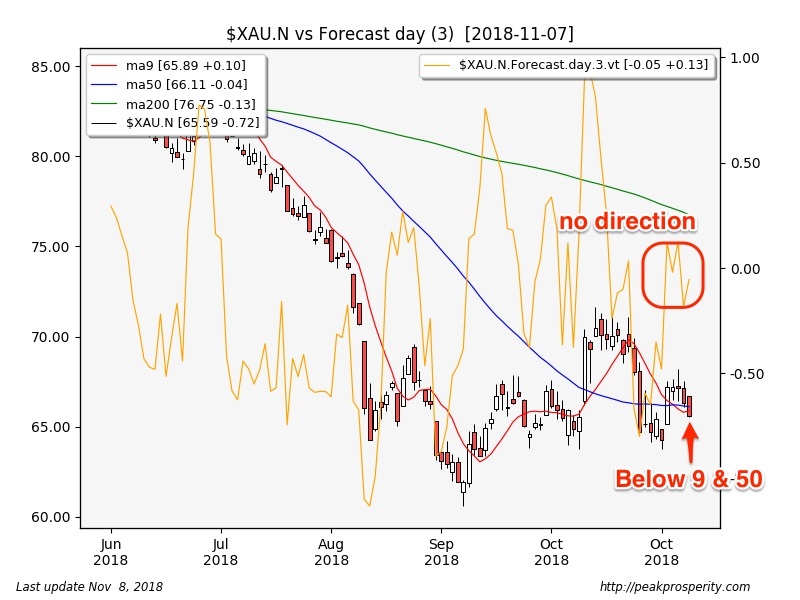 XAU dropped -0.30%, a mild move down; the southern doji candle was a bearish continuation, and forecaster dipped -0.24 to -0.30, which suggests a strengthening downtrend. XAU is in a downtrend in the daily and weekly timeframes. The GDX:$GOLD ratio rose +0.64%, while the GDXJ:GDX ratio dropped -0.83%. That's somewhat bearish. Platinum fell -1.05%, palladium dropped -0.71%, while copper moved down -0.40%. The other metals were pulled lower today – intraday, it looked as though each of the metals was more or less moving on its own. The currency move didn't help. As mentioned, the buck rose +0.73 [+0.76%] to 96.24, with the Fed announcement being responsible for at least half of the jump. 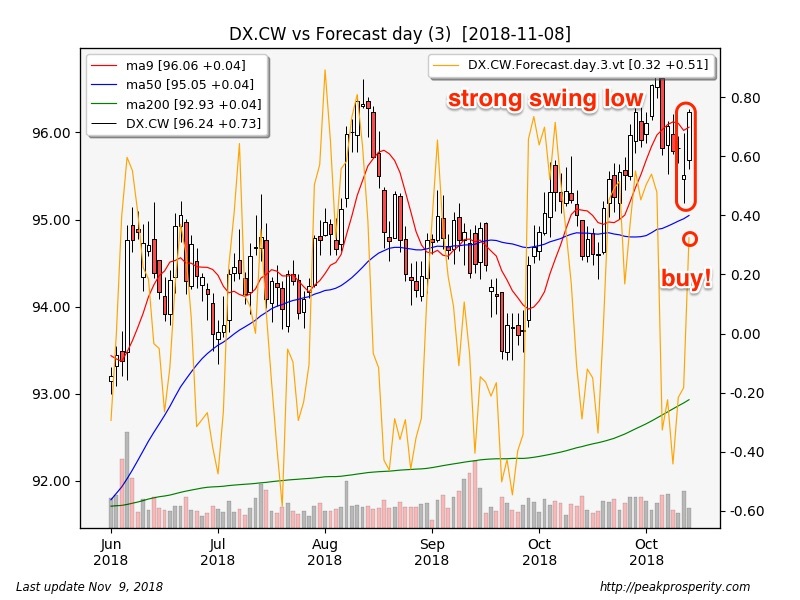 The swing low candle print was bullish (reversal 60%), and forecaster jumped +0.51 to +0.32, which is a buy signal for the buck, which is now back to an uptrend in all 3 timeframes. Crude fell -0.77 [-1.25%] to 61.01, having fallen for 9 straight days now. Once again, crude tried to rally, which failed; the long black candle was a bearish continuation, and forecaster dipped -0.03 to -0.16. Crude remains in a downtrend in all 3 timeframes. RSI-7 is now down to 11.8; this is relatively rare, with crude spending about 0.5% of its time with RSI levels this low. Still, there is no sign of reversal yet. I was seduced by the rally in oil equities, thinking they were the tell. XLE sold off fairly hard today. SPX fell -7.06 to 2806.83, with all the losses coming in the futures markets overnight. The doji candle was unrated, while forecaster dipped -0.48 to +0.28. That's a bit alarming, but SPX does remain in an uptrend in the daily & monthly timeframes. Sector map had energy leading lower (XLE:-2.17%) while financials did best (XLF:+0.29%). This was a neutral sector map. VIX rose +0.36 to 16.72. TLT rose +0.01%; once again, TLT gapped up at the open, and then sold off during the day. For the last week or so, TLT has been chopping sideways. TY tried to rally but failed, making a new low, closing down -0.04%. TY is in a downtrend in all 3 timeframes. The 10-year yield rose +2.1 bp to 3.23%. The previous high at 3.25% is close at hand. Do rising 10-year rates cause recessions? It seems as though they should, right? I can't say for sure, but I can tell you what the correlations are. (My math-enabled friends get testy when I mis-use the word correlation). Rising 10-year (US treasury) rates are not correlated with recessions. Neither are rising 1-year rates. Both are somewhat negatively correlated with recessions. That is – when 1-year and 10-year rates are rising, it is less likely a recession is on the way. 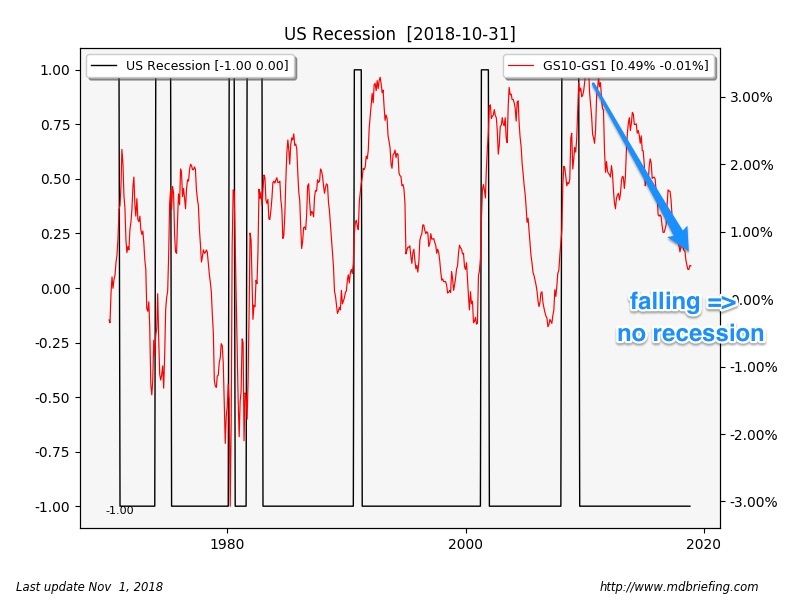 However, a rising 10-1 spread is strongly correlated with recessions. Why is that? Well, if the Fed is dropping short rates like crazy, then it believes a recession is coming, and it is usually right. Dropping 1-year rates drives the 10-1 spread higher. So if the Fed is raising rates, that's (paradoxically) good news for the economy. At least in the near term anyway. JNK fell -0.14%, dropping a bit after yesterday's strong rally. JNK remains in an uptrend. CRB fell -0.85%, making a new low. CRB is headed for a re-test of the August lows. Only 2 of 5 sectors fell, led by energy (-1.55%). Gold, silver, and the miners continue to head slowly lower. While a bid for gold remains, it is not nearly as strong as it was in weeks prior. Given the resurgence in the buck, that probably points to lower gold prices ahead. Part of the force behind the dollar's rise is the latest installment of the Brussels-Italy struggle over less than 2% of GDP in Italian government spending. The EC told Italy that its projections were too optimistic, to which Italy responded that the EC's analysis was "inadequate and partial." The EC's deadline for Italy to "rethink" its own budget is November 13th - Tuesday next week. My guess: there won't be any re-thinking. And do you think that Salvini will cough up any EU "fine"? The same group that essentially wanted Italy to be the migrant processing center for Europe? The harder they push, the more popular Salvini will get. Ultimately, that should help gold - although it will also weaken the Euro at the same time.